Thanks to their ability to combine the size and storage capacity of an SUV with the better fuel economy of a more compact car, crossovers have become extremely popular. 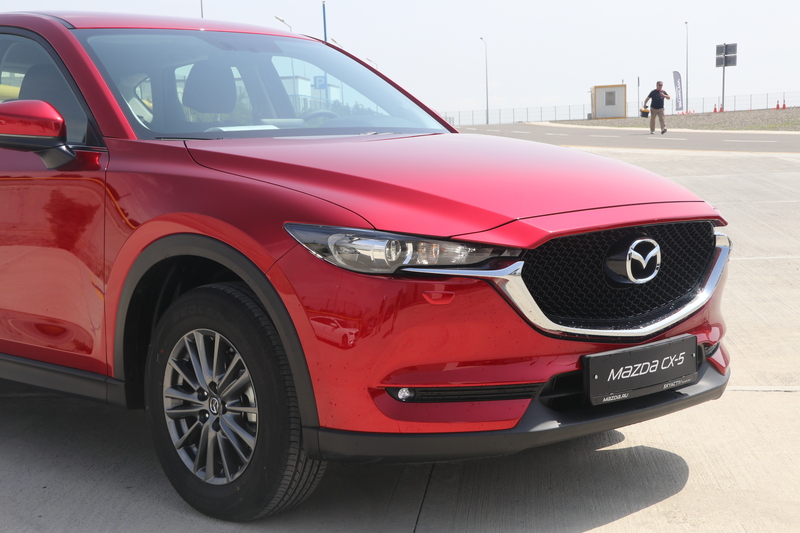 One of the somewhat lesser-known gems in the crossover field is the Mazda CX-5, a vehicle that strongly adheres to Mazda’s longstanding philosophy of creating a user-focused driving experience. The new 2018 CX-5’s exterior styling is modern yet bold, featuring sharp lines that make the vehicle stand out from the pack. A similar approach to aesthetics carries over to the interior, which is designed for maximum comfort. All trims offer a leather-wrapped steering wheel and gear selector, and the highest trim also incorporates real leather into the seats. The Mazda CX-5 seats up to five people very comfortably and offers 31 cubic feet of extra storage capacity. With high-end vehicle prices continuing to rise thanks to added technologies and enhanced features, the 2018 Mazda CX-5 enters the field as a welcome change of pace. Despite attractive styling and a fairly comprehensive lineup of luxury features, the new CX-5 is reasonably priced: MSRPs start at just $24,150 for the Sport trim, with the Touring trim at $26,215 and the Grand Touring trim topping the range at $29,645. The 2018 Mazda CX-5 features a 2.5-liter 4-cylinder engine capable of producing up to 187 horsepower and allowing for a towing capacity of up to 2,000 pounds. Both the block and cylinders of the engine are machined from aluminum, cutting down the engine’s weight. Though not overly powerful, this engine puts the CX-5 in a similar horsepower range with many other popular crossover SUVs. The engine is new for the 2018 model year, allowing for the deactivation of two cylinders when full power isn’t needed. This feature considerably increases the CX-5’s fuel efficiency and helps drivers save money by reducing fuel waste. All three trims come with a standard 6-speed automatic transmission. For those who prefer to drive a manual, this transmission can optionally be shifted manually. This transmission also offers a feature known as Sport Mode, in which both the transmission’s shifting thresholds and the engine’s throttle are adjusted for improved response and acceleration. Each trim can also be equipped with either front-wheel drive or all-wheel drive. Though its power is only average for its class, the 2018 Mazda CX-5 does distinguish itself in handling. Mazda’s Skyactiv Vehicle Dynamics system achieves exceptional handling by automatically adjusting power delivery and making subtle yet effective changes in weight distribution when the vehicle is turning. This system makes the 2018 Mazda CX-5 a smooth and enjoyable ride. In addition to these important safety features, the 2018 CX-5 also offers a fairly broad set of entertainment features to help make your drive fun as well as safe. All trims are equipped with the Mazda Connect Infotainment system, an integrated system that’s compatible with most modern electronic devices and many music streaming services. The Sport trim includes two USB inputs in the front of the vehicle, with another two added in the back on both the Touring and Grand Touring trims. To give the driver full control of these systems, a 7-inch color touchscreen control panel comes standard on all three trims. Given all of its features and value, the 2018 Mazda CX-5 performs very well against similar vehicles in its class. In a comparison of 44 crossovers conducted by U.S. News and World Reports, the 2018 CX-5 came in second. Of the top five crossovers, the Mazda CX-5 boasted the lowest MSRP. Despite this excellent overall performance when compared to similar crossovers, there are some areas in which the 2018 Mazda CX-5 doesn’t stack up. In storage space, for instance, the CX-5 loses to more spacious crossovers such as the Subaru Outback. The Mazda CX-5’s warranty, which offers 3-year/36,000-mile basic coverage and 5-year/60,000-mile powertrain coverage, is also a bit weak; the Kia Sorento, for instance, comes with 5-year/60,000-mile basic coverage and 10-year/100,000-mile powertrain coverage. Thanks to its lightweight engine, cylinder deactivation capability and other fuel-saving design features, the 2018 Mazda CX-5 boasts a fuel efficiency rating of 25mpg in the city and 31mpg on the highway. Both of these ratings reflect the CX-5 equipped with front-wheel drive. If equipped with all-wheel drive, the ratings decrease slightly to 24mpg in the city and 31mpg on the highway. Keep in mind that frequent use of Sport Mode can cause increased fuel consumption. If you’re interested in buying a crossover in 2018, the Mazda CX-5 is one that should be on your list. Between its value, high-end features, and fuel economy, the CX-5 is a great crossover SUV for families or individuals. Even with a few cons, the 2018 Mazda CX-5 still more than earns its place as a highly-rated crossover. Interested in owning a new 2018 Mazda CX-5? Start a search today.